Obama said Caterpillar’s CEO has told him that if the stimulus bill passes he would be able to rehire some of those employees. President Barack Obama signed his $787 billion economic stimulus package into law Tuesday, with an upbeat speech emphasizing the road to recovery. Caterpillar Inc, the world’s largest maker of construction and mining equipment, notified an additional 2,454 workers in three states on Tuesday that they were losing their jobs as the company continues to try to bring production in line with plummeting demand. Yes, car sales are down. Yes, Wall Street’s in the pits. Job losses are dismal and mounting. What about the housing market? Let’s not even go there. But I believe several factors — low interest rates, relatively low energy costs and renewed taxpayer and consumer confidence in the incoming presidential administration — could help ignite at least moderate growth before 2009 winds up. green shoots ahead – and it will all be because Obama comes to the rescue. The U.S. government just put polar bears on the threatened species list because climate change is shrinking the Arctic ice where they live. Never mind that polar bears are in fact thriving — their numbers have quadrupled in the last 50 years. Never mind that full implementation of the Kyoto protocols on greenhouse gases would save exactly one polar bear, according to Danish social scientist Bjorn Lomborg, author of the book “Cool It!” Yet 300 to 500 polar bears could be saved every year, Lomborg says, if there were a ban on hunting them. 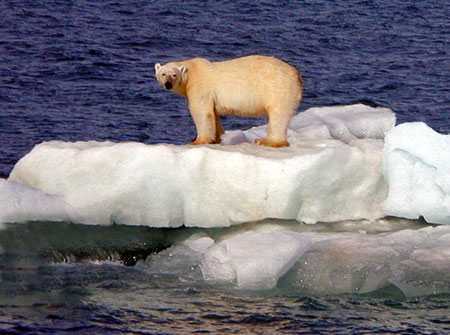 What’s cheaper — trillions to trim carbon emissions, or a push for a ban on polar bear hunting? The country is being forced to subscribe to a modern version of transubstantiation, whereby corn is miraculously transformed into sinless energy even as it does worse damage than oil. Plastic grocery bags are being banned, even though they require less energy to make and recycle than paper ones. But the polar bears make for such cute, cuddly pictures. I am married to someone who has seen the aftereffects of these little cuties tearing off people’s arms and legs however, so I’m not quite so sure its a good thing to have them on the endangered list.